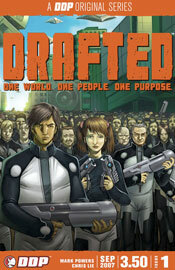 Drafted offers a slightly different take on the tried and true formula of an alien invasion, uniting all of humanity in a struggle against oppression from galaxies unknown. While the front cover proudly displays an entire mob, dressed for battle with weapons in-hand, this first issue offers nothing quite that interesting. Instead, the creators appear to be carefully setting the stage for an enormous, years-spanning tale. If the pace of this issue is any indication, it’s going to be a very long ride. Evidently, writer Mark Powers intends for this story to carry an epic, racially sensitive cast with a variety of differing viewpoints and experiences. Handled properly, that’s a basic recipe for a good story, but it feels like he’s giving us too much too soon on this occasion. A strong cast can’t be rushed to the forefront, introduced in one fell swoop – it should be spread out a bit. After just twelve pages, Powers has already introduced nearly that same number of central characters, which led me to feel overwhelmed by detail. That seems to be a theme that carries throughout the book – an abundance of detail, overkill to the extent that it shifts from a positive to a negative. Powers tells a story that’s clearly been given a lot of time to simmer in the back of his mind, but also one that would have benefited from a touch of selective editing. This opening chapter really takes its time moving from start to finish, with frequent cuts to television screens and lengthy monologues more the rule than the exception. If a few characters had been granted smaller roles, a few political speeches cut in half, the story would flow much more smoothly and I think the sense of wonder and awe that the writer was after would have been within reach. As is, those sensations only shine through on a couple impressive pages. Artist Chris Lie and colorist Joseph Baker work together to create a strong animation-influenced visual flavor within Drafted’s 22 pages of content. Lie’s style is at once simplistic and detailed, restraining itself when tempted to overcomplicate an individual character or object, while at the same time tending to every item in the area. In this sense, he’s a good compliment to Powers’s story – neither flinches at the prospect of excessive explanation. Lie uses his linework sparingly, allowing Baker to handle nearly all of the shading with his palette, and in so doing brings a lot of personality to the tale. While this style does give the book a look and feel all its own, it’s not without its shortcomings. Lie encounters frequent problems with perspective, especially when his characters appear in an underdetailed setting. During the first half-dozen pages, when he’s granted the opportunity to run wild with the contents of a convenience store, the visuals are wonderful. When he’s asked to deliver a bit more focus to the characters, his limitations jump to the forefront. Where his detailing on a monotonous rack of potato chips seems effortlessly stylish, his work with facial expression and body language is more dull, forced and rudimentary. All in all, I found Drafted to be unfocused in nearly every respect. There’s a lot of potential here, as evidenced by the few occasions when story and art come together to deliver something out of the ordinary, but those moments are overshadowed by the pace and level of unnecessary detail that surround them. I’m all about a good cast of characters, but at some point you have to draw the line, stop introducing new faces and expand upon the ones you’ve already got. Flip through this in the store and think about what it could’ve been.